Perhaps it’s the sense of detachment that comes from long hours spent staring at screens, peering into pixels and abstraction. But whatever the reason, when experimenting with design and music, creators seem increasingly drawn to simple, physical interaction. Somewhere in the mysterious play between senses, between seen color and unseen sound, they look for intuitive relationships. Designers Hideaki Matsui and Momo Miyazaki send in the latest adventure in induced synesthesia. Students at the Copenhagen Institute of Interaction Design, they use a camera to connect color to sound. The system of audible color is based on a marriage between basic color and music theories. The colors of red, blue, and green are the visual foundation for color-mixing and the music notes A, D, and F are the base triad that corresponds to the colors. The secondary colors (colors made when the foundational three are mixed) of purple, teal and brown are tuned to the musical triad C, E and G. The visual of the mixing of red, blue and/or green mirrors the aural output of combined notes. The ‘painting’ aspect is not restricted to water droplets from a pipette. 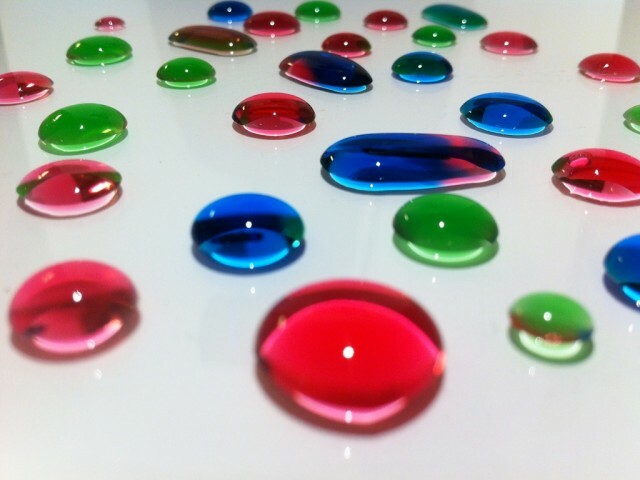 Numerous experiments were performed using substances such as acrylic paint, food dye in milk with soap, and ordinary household objects. Each investigation created a new type of fun and easy gestural music-making.